Parish of Foxford – "Together through faith"
Pease feel free to make a donation towards the restoration of the Old Parochial House. We hope to restore this property and make it into our new Parish Centre. Click into our News & Events Page above where you will find more information about our plans for this project and how to make a donation if you so wish. You are welcome to the Website of Foxford Parish. Located in Co. Mayo, Foxford is a parish of the Diocese of Achonry. There are three Church areas in the parish. Foxford (traditionally known as Toomore) is situated in east Mayo. The parish boundary on the west is the river Moy which separates the parish from the diocese of Killala. There are three churches in the parish. On the north side, tucked into the Ox Mountains is the church at Attymachugh, which originally was a primary school. On the east side bordering the parish of Swinford, is the church of the Assumption in Toomore. 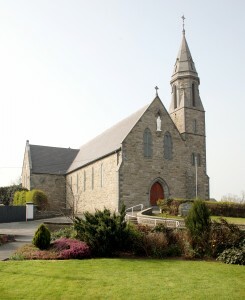 The parish church in Foxford was built in 1879. In 1961- 62 major renovations were carried out on the church, and on 27th. September 1962, Bishop James Fergus re-dedicated the church to St. Michael, the Archangel. The parish is also home to the beautiful Convent Chapel which was built by the Sisters of Charity in 1925. The Foxford Woollen Mills, founded by the Sisters of Charity in 1892, is still in operation and attracts many visitors throughout the year. Foxford also has an Addiction Treatment Centre, appropriately called ‘Hope House’.